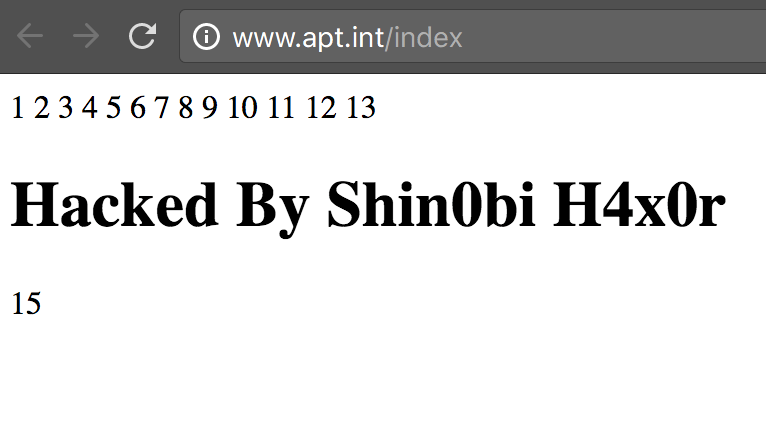 The Asia Pacific Telecommunity (APT) official website has just been hacked and defaced by a hacker going by the code-name of “Shin0bi H4x0r”. Asia-Pacific Telecommunity (APT) is an intergovernmental organisation that operates in conjunction with telecom service providers, manufacturers of communications equipment, and research and development organisations active in the field of communication, information and innovation technologies, as per the About Us on their official website. along with some random numbers going from 1 till 15 across the deface page. The hacker replaces the number 14 to type his deface message. We are still unsure why. Probably some cipher for web administrators to solve. Whatever the reasoning behind the attacks may be, this surely proves and brings to surface the fact that the APT’s website and server security is extremely poor and needs an urgent update and thorough examination. The web administrators and security staff of the website need to be on high alert and pinpoint the vulnerabilities to prevent future attacks. As of the writing of this report, the website is still defaced.